Rebates Currently Available to City of Santa Cruz residents! Applications will be accepted until June 15, 2018. Rebates will be awarded on a first come, first-served basis until grant funding is depleted. Read the Rules and Requirements of the rebate program. Construct your project to Monterey Bay Friendly Landscaping standards. Save all of your receipts for the project, as you will need to submit them when your project is complete. Schedule a post-construction site visit with a Qualified Monterey Bay Friendly Landscaping Rater who will certify that your project meets Monterey Bay Friendly Landscaping standards. When your project is complete, fill out the online application (below). Upload pre- and post-construction photos. Note pre-construction photos are not required for rainwater harvesting projects. Please enter the name of the Qualified Rater that certified your Monterey Bay Friendly Landscape project. A Qualified Rater must certify that your landscape project meets Monterey Bay Friendly Landscaping standards before a rebate can be issued. Enter the name that should appear on your rebate check. If you are not the property owner, please upload a signed permission statement from the property owner below. Please attach a dated and signed statement from the property owner, including property owner's name and contact phone number, giving the rebate applicant (the renter) permission to install the rebated Monterey Bay Friendly Landscaping projects at the property listed on the rebate application. $0.25/gallon of water captured in cisterns or barrels. 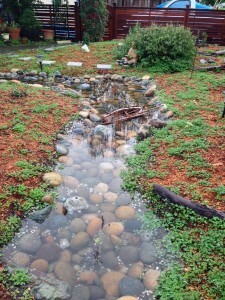 In the Quantity field, enter the capacity (in gallons) of the rainwater harvesting system. $1.00/sq. ft of impervious area replaced with permeable hardscape materials or landscaping. In the Quantity field, enter the total square feet of impervious area replaced. Please note that even if the value in this field is greater than $500, the maximum rebate amount you will receive is $500. The total value of the rebated project(s) should equal the sum of the project construction receipts submitted above. Note: Pre-construction photos are not required for rainwater harvesting projects. I have read, understand, and agree to the Monterey Bay Friendly Landscaping Rebate Program Rules & Requirements. By submitting this application, the applicant and property owner holds harmless Ecology Action and the State Water Board, and their officers, agents, and employees from any and all liability, claims, losses, damages, or expenses for personal injury or property damage arising from the installation and use of green infrastructure projects funded through the Monterey Bay Friendly Landscaping Rebate Program.